Protein is often associated more with bodybuilders and athletes than the general public, but it's an important macronutrient, regardless of your goals. Sedentary adults need around 0.4 gram of protein per pound of body weight each day, while those engaging in recreational exercise need around 0.5 gram per pound, and serious endurance or strength athletes require between 0.6 and 0.9 gram per pound. If you're struggling to get enough protein from the foods you eat, look to high-protein drinks. Something as simple as adding a few glasses of milk into your diet each day can boost your protein intake since 1 cup of cow's milk provides around 8 grams of protein. Milk is also packed with calcium, zinc, magnesium, potassium and B vitamins. In addition, many milks are fortified with vitamin D, which is vital for building healthy bones. For those with a dairy intolerance or allergy, soy milk is a viable alternative. Most soy milks contain around 7 to 10 grams of protein per cup and around 4 1/2 grams of fat, making them similar nutrition-wise to 2 percent milk. Exercise caution when choosing your soy milk, though, advises Go Ask Alice! at Columbia University. Soy milk typically doesn't contain nearly as many B vitamins or as much calcium as dairy, so look for a fortified version or make sure you're getting these nutrients from other sources. Drinking your protein in shake form is also a way to help bump up your intake without resorting to eating more food. Many protein shakes contain around 20 to 30 grams of protein per serving, with very little in the way of fat or carbohydrate. You can get dairy-based protein powders, such as fast-digesting whey or slow-digesting casein, as well as egg protein, soy protein and other plant-based proteins. Protein powders aren't necessary, but they are convenient when you're on the go and don't have time for a full meal, notes sports dietitian Kelly Rossi. You can make homemade smoothies more protein-dense by adding extra ingredients to them. If you're putting together a smoothie using fruits and veggies, add a little cottage cheese or low-sugar, low-fat yogurt to boost the protein while keeping the nutrient content high. The McKinley Health Center at the University of Illinois also suggests adding powdered skim milk to smoothies, shakes and other beverages to increase the protein content. University of Arizona: Got Protein? 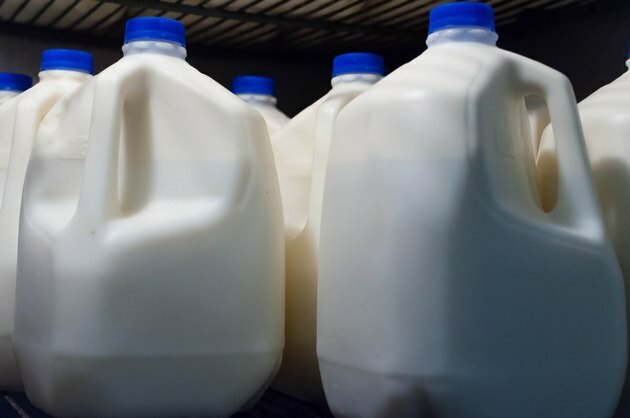 Best Health: Is Milk Bad for You?